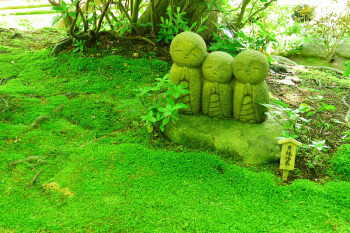 Hase [長谷] is in west of Kamakura City that known for Great Buddha statue [大仏] and Hasedera Temple, but is it really enough just by see it? We say "Not enough!". 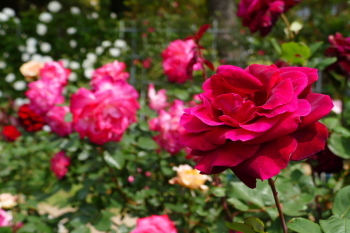 Because there are a lot of places known by the beautiful seasonal flowers in this small town. Where to go & What to do? When you are in case of emergency situation here, please see the page. 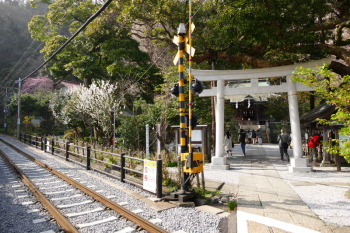 There are many tourist spots around the station such as Kamakura Daibutsu, Hasedera Temple and more. So it have been crowded with travellers during daytime through the year. 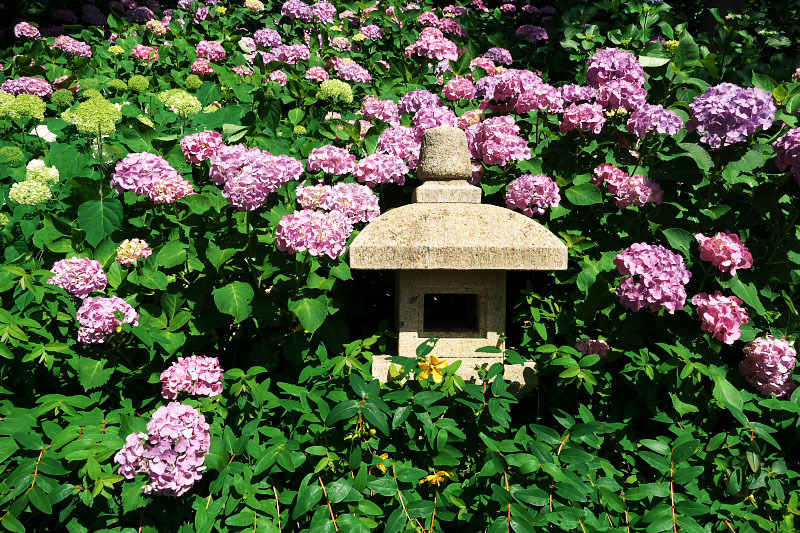 Hasedera Temple [長谷寺] is the one of the most well-known hydrangea and other seasonal flower spot in Kamakura. 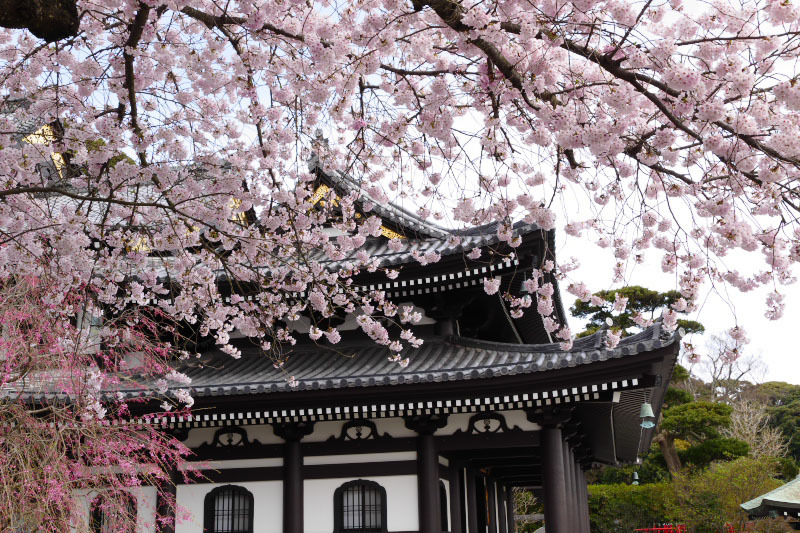 The temple is said to have been founded in 736 (Nara Period), and one of the oldest temple in the area. From old days, this temple had repair and renovation with response to the aegis from the those in power of the time, such as Ashikaga Takauji [足利尊氏], Ashikaga Yoshimitsu [足利義満] and Tokugawa Ieyasu [徳川家康]. If you have a train pass, don't forget to show it at the counter when you buy a entrance ticket. 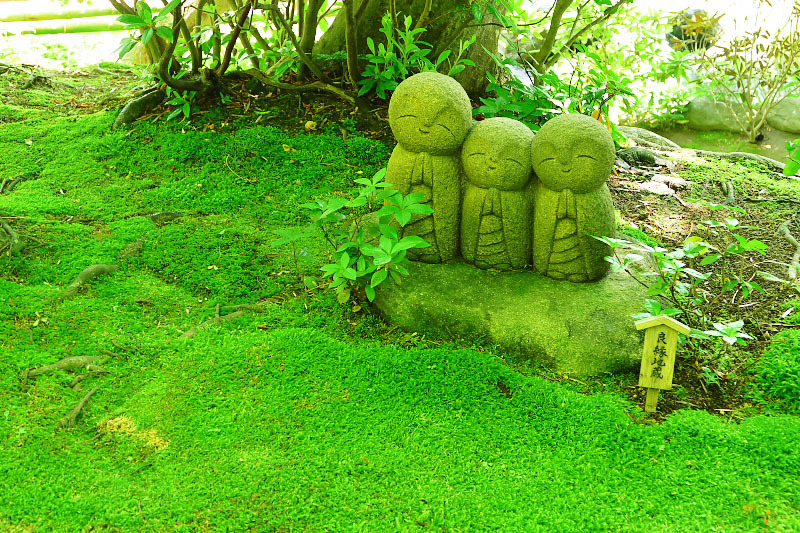 Because you can get a souvenir from Hasedera Temple! The precincts of Hasedera Temple is divided into Upper Area and Lower Area. 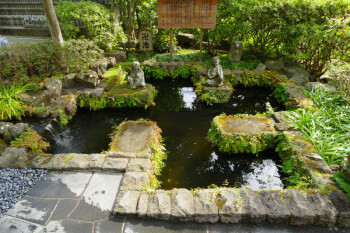 In Lower Area, there is a entrance, wide traditional Japanese garden with two ponds, Kare-sansui style dry landscape garden, Benten-kutsu cave, unique smiling Buddha statue "Nagomi Jizo" and some buildings. Between the Upper Area and the Lower Area, there is a small Jizo-do hall building, garden and Manji-shaped pond. 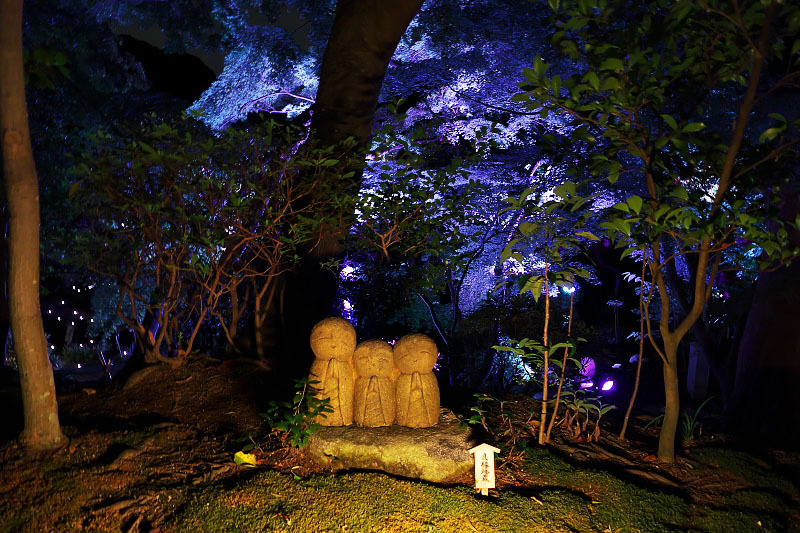 Thousands of small Jizo statues are placed around the building. A pretty little Jizo statue has been put on the right side of approach to Jizo-do hall. 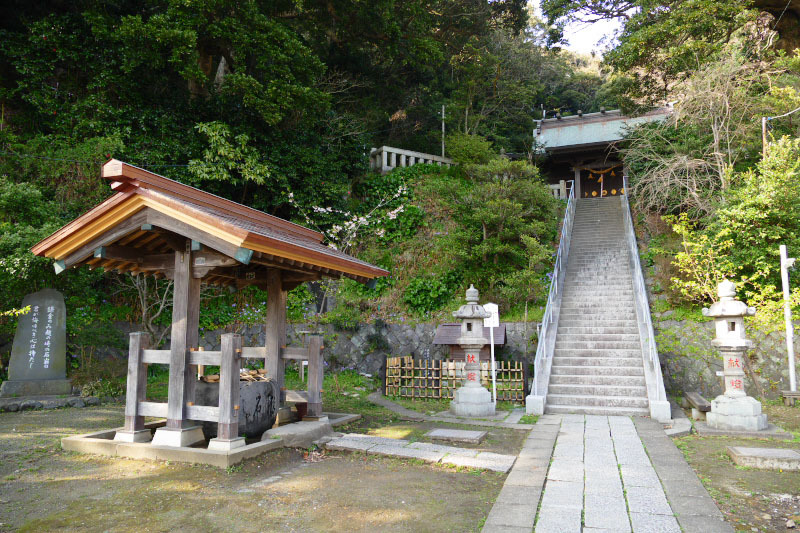 Major temple buildings stands in the Upper Area, such as Kannon-do Hall, Amida-do Hall and Kyozo. 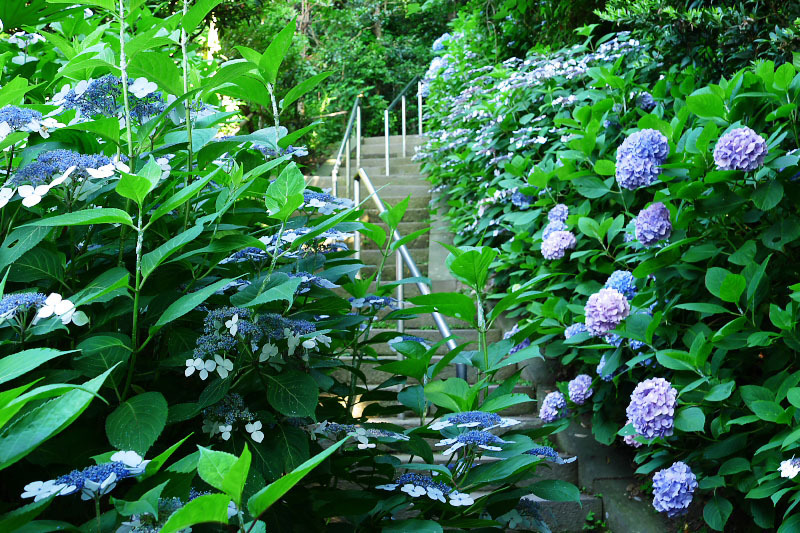 Also there is a museum, viewing terrace, restaurant and famous "Mountain path of hydrangea". 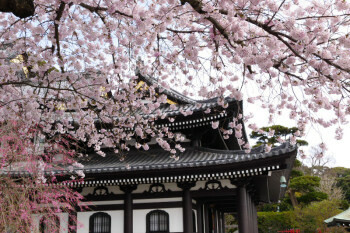 In addition, you can see beautiful cherry blossoms in April around these buildings. Inside of Kannon-do Hall the main temple building, Hase Kannon statue of height 9.18 meters - the principal image of Hasedera Temple, is displayed. 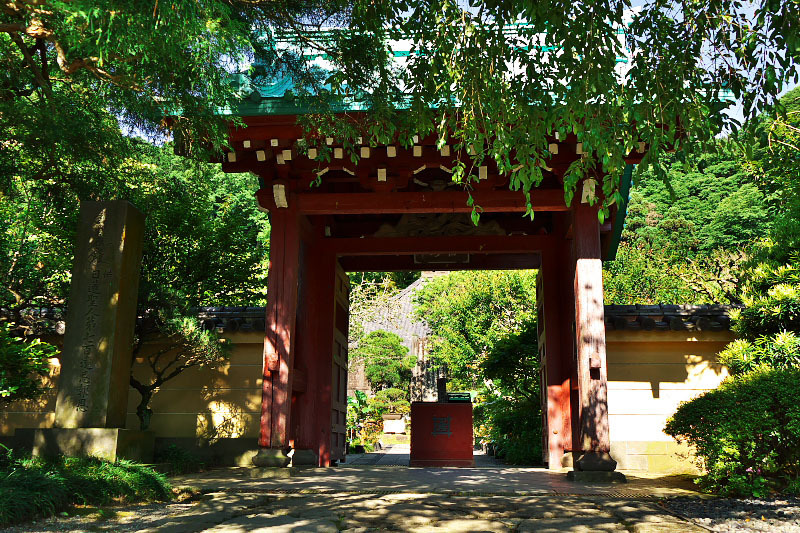 The official name of the statue is "11 headed Kannon Statue" and is said that was made by carving a large Kusunoki tree in 721. 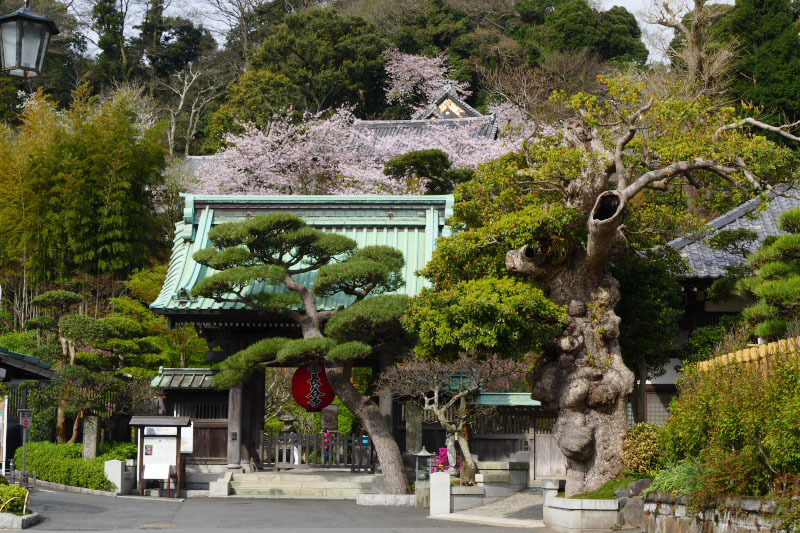 At that time, two Kannon statues were made from the tree. 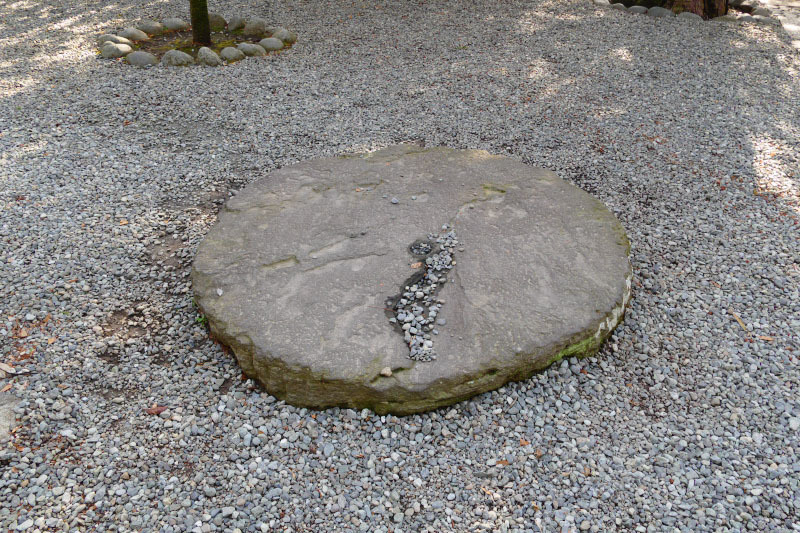 One was enshrined in Hasedera Temple in Nara, and the other one was submerged in the sea with a wish. 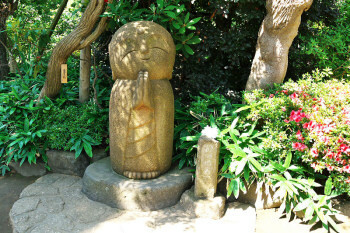 In 736, this submerged statue emerged in the sea off current Yokosuka City and was enshrined here. At Kyozo building, there is a rotatable shelf containing Buddhist sutras. 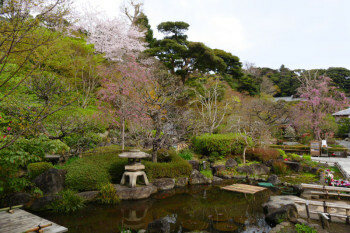 It is said that, you can obtain the same merit as having read all sutras contained in the shelf, if you rotate it once. However, the day on which we can rotate the shelf is determined to be only 18th of every month, first 3 days from the new year, April 8 and August 10. 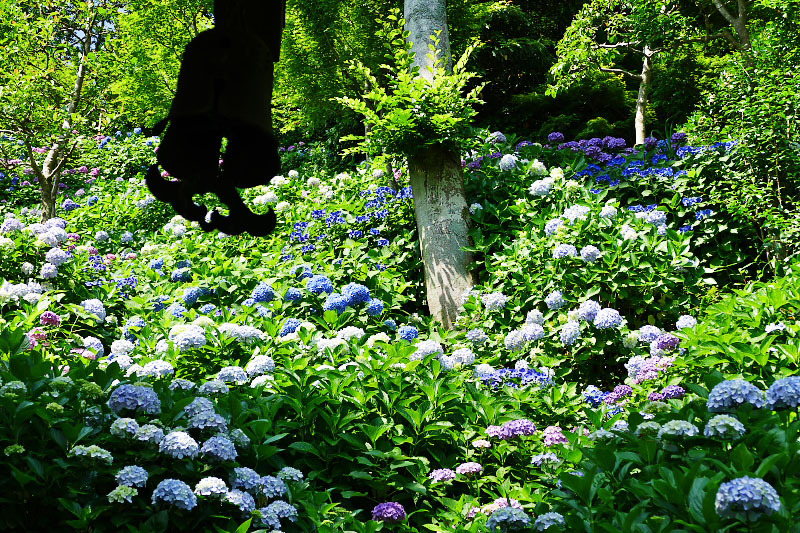 On the "Mountain path of Hydrangea" you can walk among over 40 kinds of hydrangea flowers and it is very popular attraction with visitors. 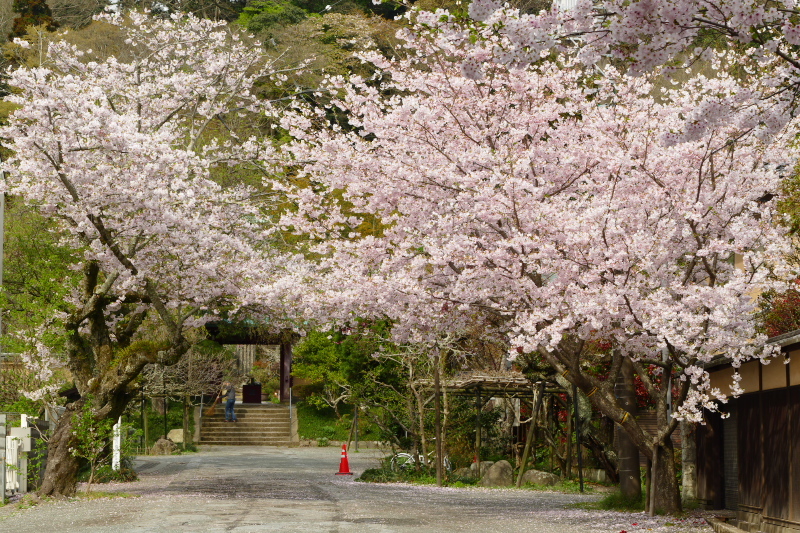 In some cases, it have to wait more than 3 hours to enter during peak season in June and July. 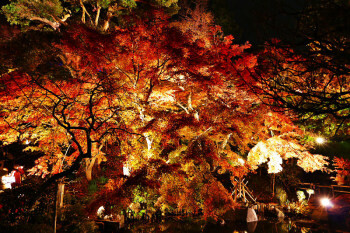 Hasedera Temple is also known for illumination event on August and autumn leaves season. Click here for detailed info and photos of Hase no Akari summer illumination event that is held on the end of August and Autumn Colors garden illumination event that is held on the middle of November to the beginning of December. 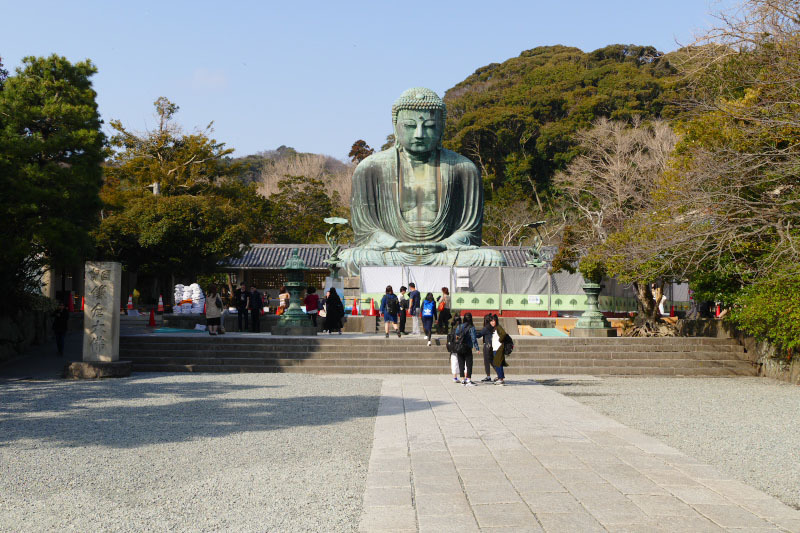 One of the famous tourist spot in this town is Kotokuin Temple [高徳院] also known as Kamakura Daibutsu [鎌倉大仏] (Great Buddha Statue). 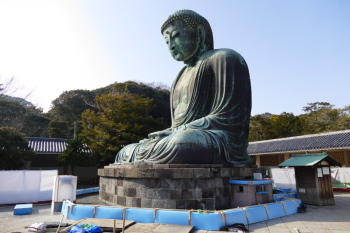 A 13.4 meters height (pedestal included) and 121 tons of gross weight Buddha Statue that was built from 1252, is one of the national treasure of Japan. 20Yen surcharge to enter inside of Great Buddha Statue. 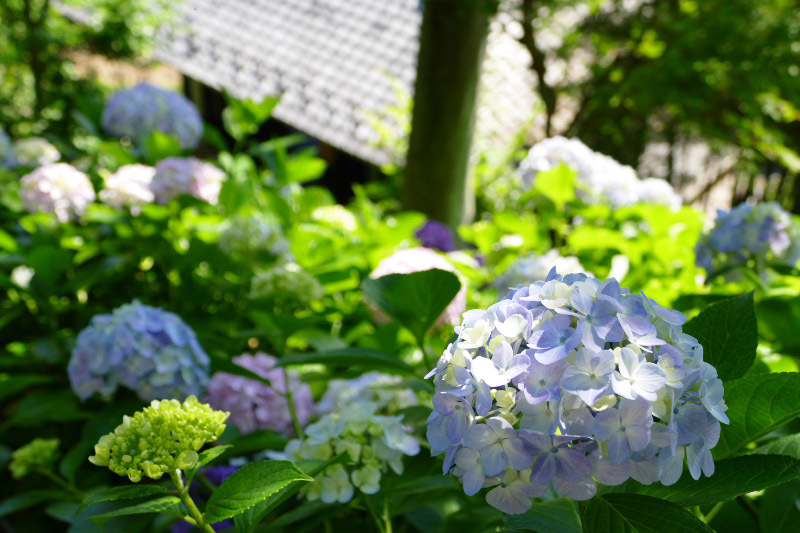 *We use some photographs that was taken during renovation work in 2016, because it is rare sight. All clear and no obstacles now. 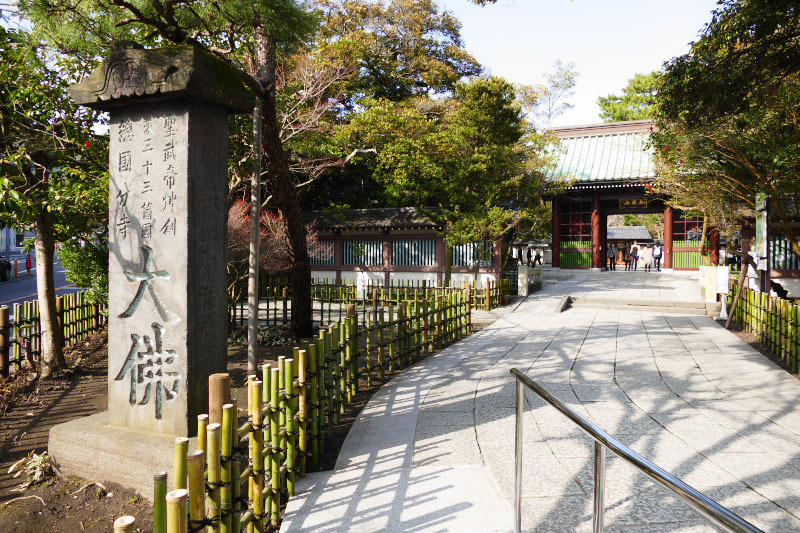 The foundation year of this Kotokuin Temple is unknown, but the record that the construction of Great Buddha statue began in 1238 in in the ancient document. 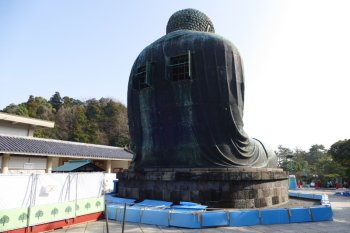 There is also a record that the wooden Great Buddha statue was near completion in 1242. Then, it was newly rebuilt in copper construction is the current statue. 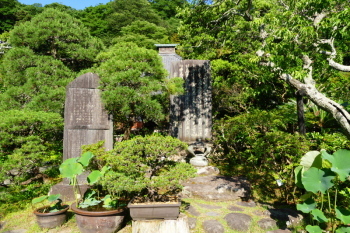 The statue was stored in the building like the one in Nara at first time constructed. But it was hit by several storm and earthquake from 1300s to 1400s and the building collapsed. 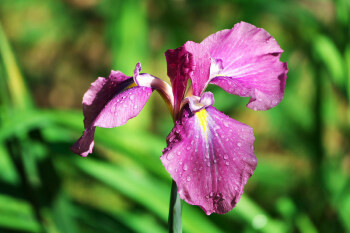 Then, it was in a condition to be displayed under the sun like the present. 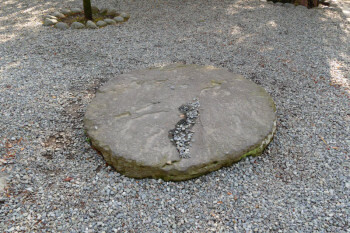 In some places around the statue, the paving stones of the foundation of the building still remain. 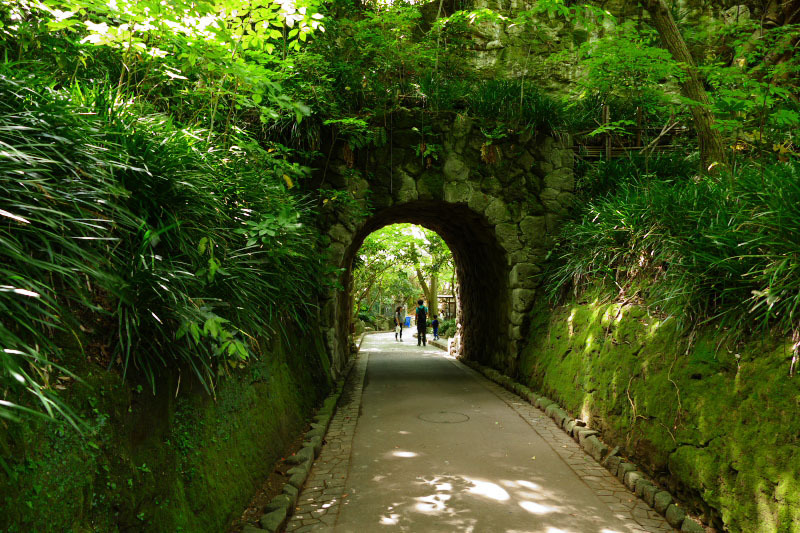 It is possible to enter the inside of the Great Buddha statue and see it. 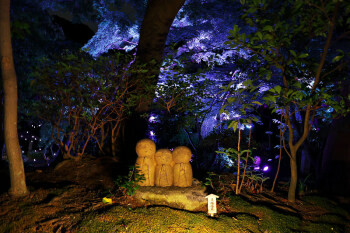 Therefore, on the back of the statue there is a window for the interior lighting. Grains in the hair which it seems like to sprinkle a tight curled men's permanent is called as "Rahotsu" and have 656 pieces in total. A huge straw sandals is displayed in the building on the right hand of the statue. 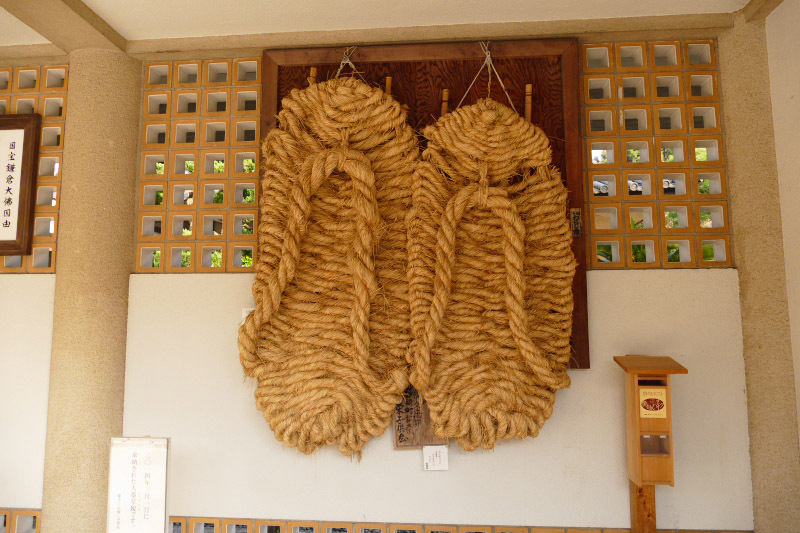 This 1.8m in length, 0.9m in width sandal is produced and donated by a neighborhood association in Hitachi-ota city of Ibaraki every three years. 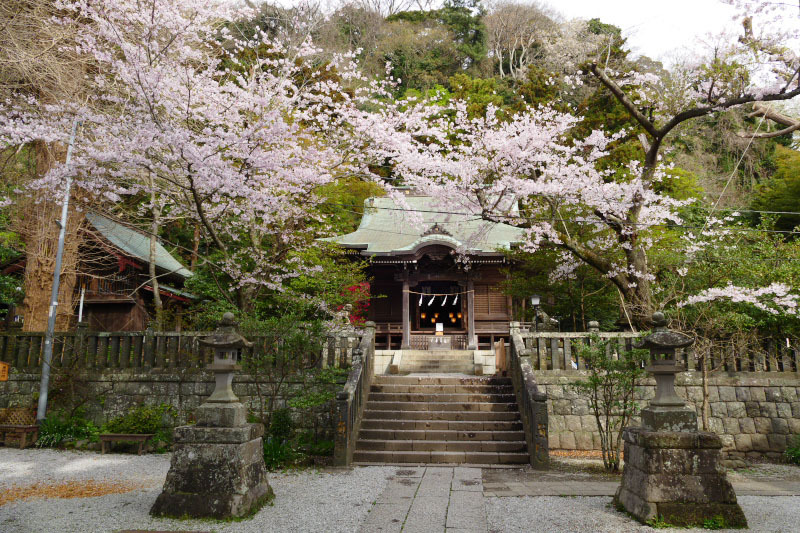 Kosokuji Temple [光則寺] is known as one of the leading "Temple of the flower" in Kamakura and able to see many seasonal flowers through the year in a tranquil atmosphere. In particular, a tree of Hall crabapple ("Kaido" in Japanese) of a certain 200 years old that is planted in front of main temple building and more than 200 kinds of hydrangeas in the garden are well known. 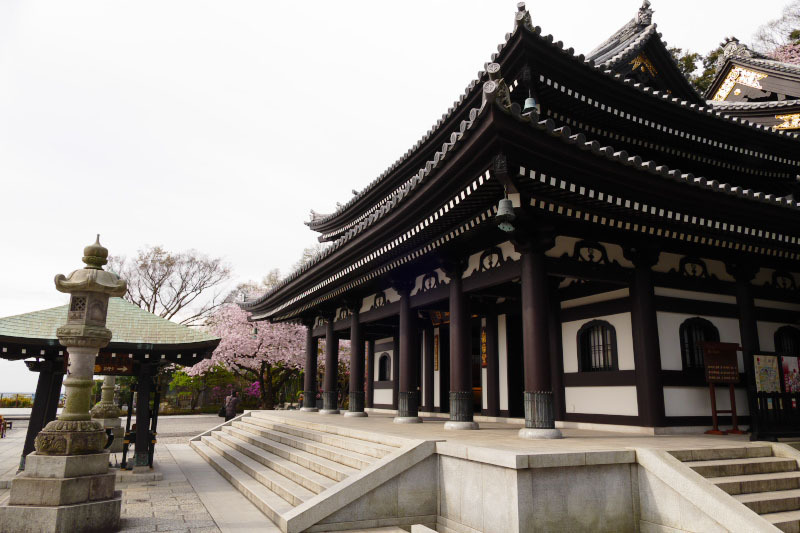 The temple was founded by Yadoya Mitsunori (A senior statesman of Hojyo Tokiyori - the 5th authority of Kamakura Shogunate) in 1274 renovating his house. Main building was re-build in 1650 (Edo period). 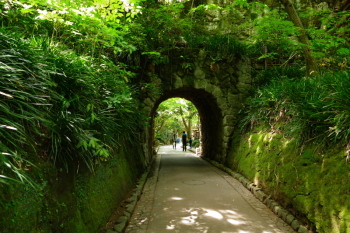 In the precincts, there is a cave used as a prison which imprisoned a disciple of Nichiren at one time. *Put the admission in the red wooden box in the center of the entrance. Goryo Jinja Shrine [御霊神社] is a shrine at the mountain side of Hase town and next to railroad side. 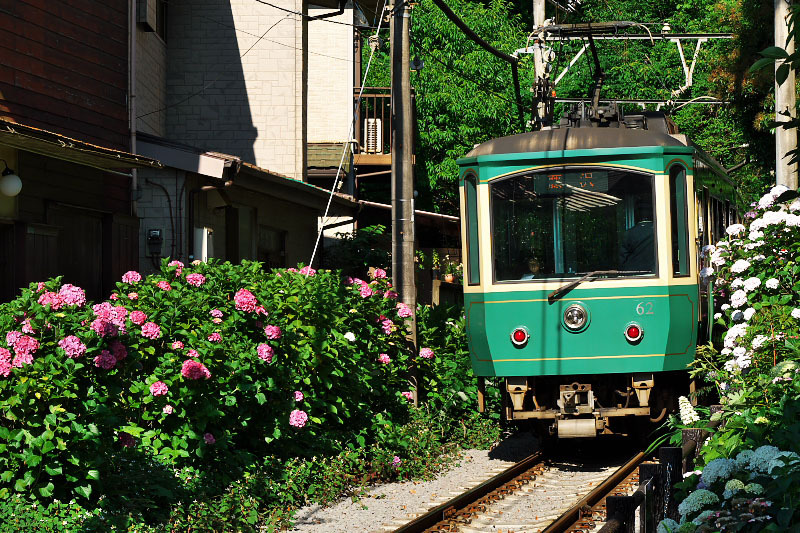 Here become popular hydrangea flower viewing spot with Enoden train in recent years. When the train exit the old tunnel, row of hydrangea trees is followed on both side of railroad in June and July. 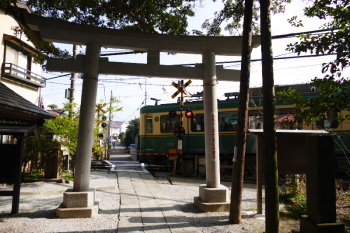 There is a small railroad crossing just in front of precincts and it is the main entrance to the shrine. 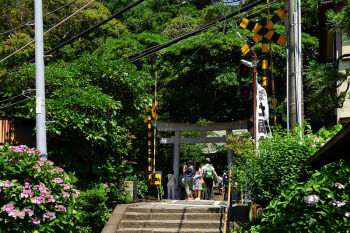 Goryo Jinja Shrine is also appeared on a Japanese TV drama few years ago and becomes a popular photo spot especially for ladies now. 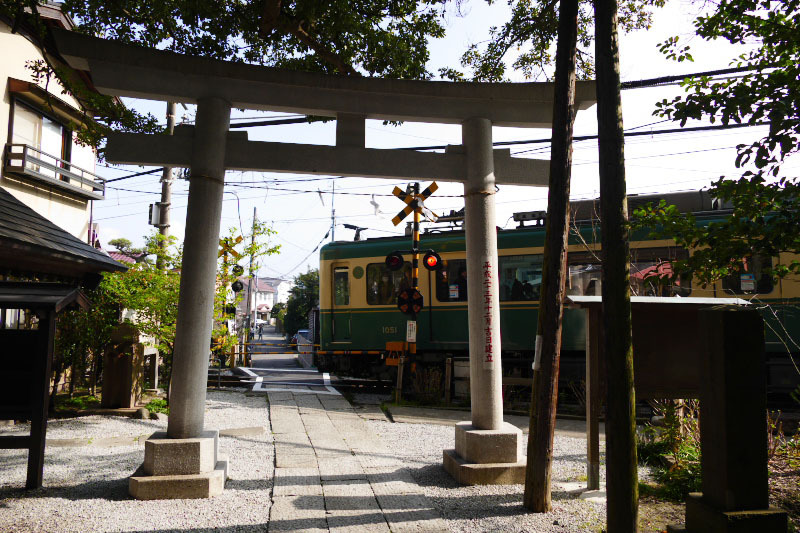 This Goryo Jinja Shrine known by the rare and strange festival "Menkake Gyoretsu"[面掛行列] that men who put on the mask which imitated various Gods and parade around the town is held on 18 September every year. These old masks are re-produced in 1768 and can be seen at the museum of the precincts usually. Going to the center of Hase town, you will pass through the narrow alley of the residential area. So, you have a chance to glimpse of Japanese daily life space. 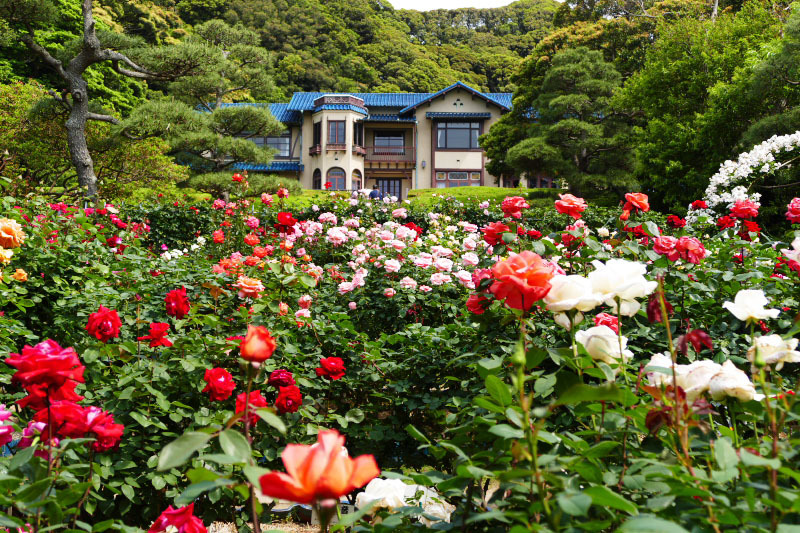 Hase town was popular villa place in Kamakura during Meiji and Taisho era, among the royalty and the nobility, politician, military officer and more. 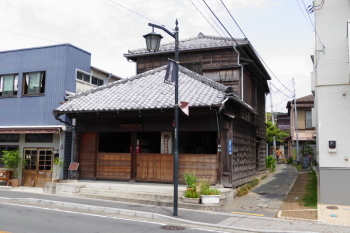 So, there are many old buildings and houses preserved regardless of the Japanese and western of the style. 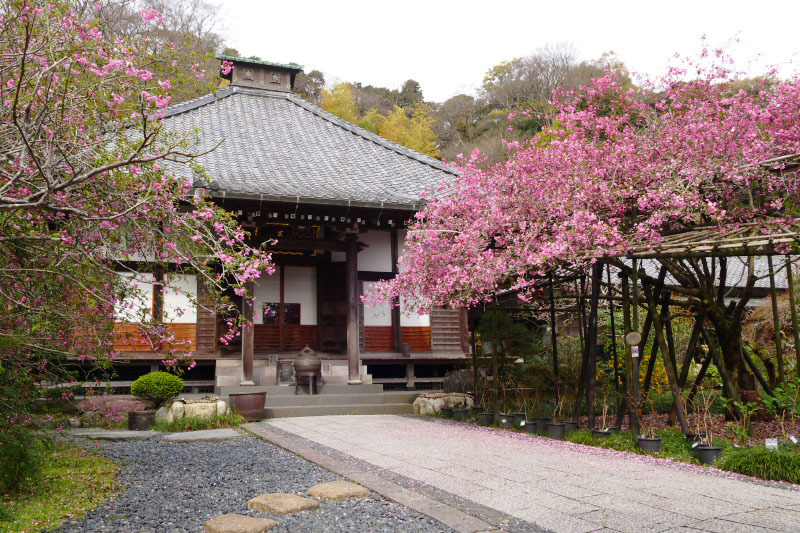 Most of these buildings and houses continue being still used carefully such as a Ryokan (Japanese style hotel), as a playground for children and as a personal residence. About 10 minutes walk from Hasedera Temple, there is a old western style house in the forest. It is Kamakura Museum of Literature [鎌倉文学館]. Closed on Monday (Open if it is a national holiday), 29 December - 3 January and change work period of the display. 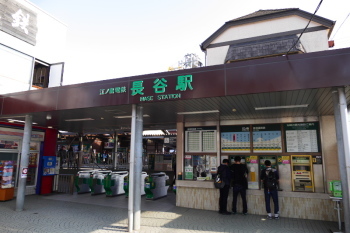 100Yen or 200Yen for elementary school or junior high school student. *Admission may vary by an exhibition to hold during the period. 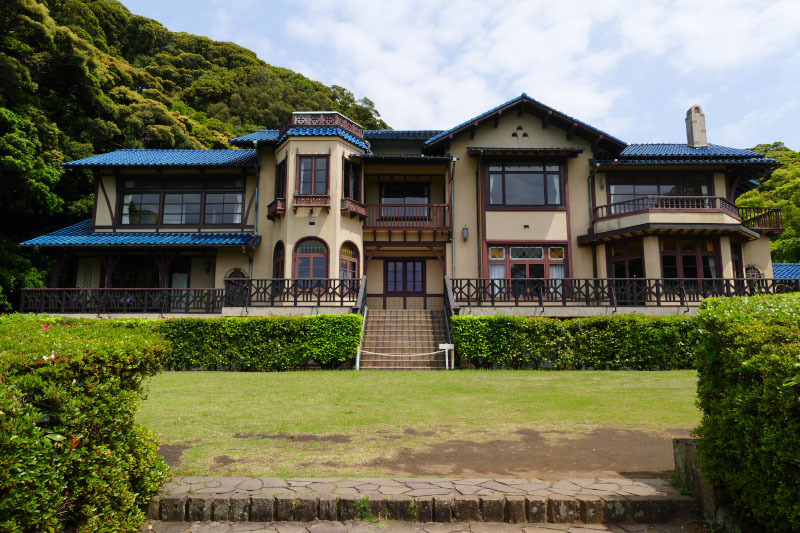 This house was built in 1936 as a villa of Toshinari Maeda (a descendant of the Lord of the Kaga Domain in Edo era), and was donated to Kamakura City in 1983. 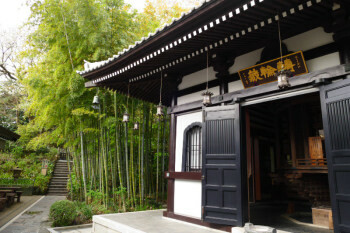 Then it was opened as museum of literature in 1985 after the renovation work. 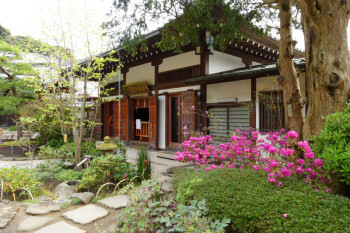 The museum displays the documents and references of the literary people such as Yasunari Kawabata, Jiro Osaragi, Ton Satomi, Hideo Kobayashi, Soseki Natsume, Toson Shimazaki, Ryunosuke Akutagawa, Osamu Dazai and more in relationship with Kamakura. 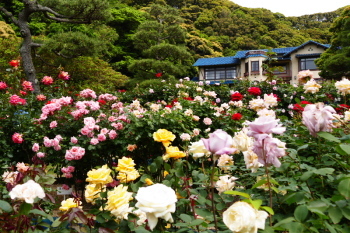 The museum is also known by the beautiful rose garden. 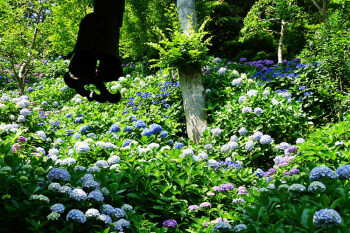 There is 2 times of in full bloom season in a year, between the middle of May to the middle June and between the middle of October to the middle of November. At the time of full bloom, it is crowded with many tourists immediately after the opening in the morning. 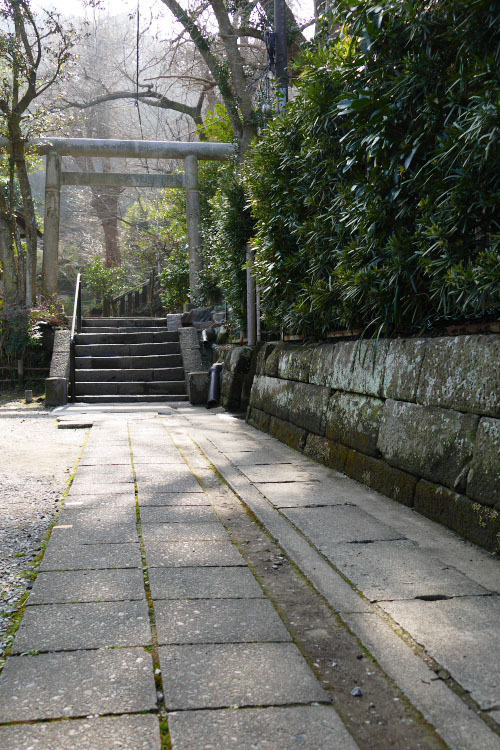 On the way to Kamakura Museum of the Literature from the center of Hase town, there is a shrine standing quietly between the houses. 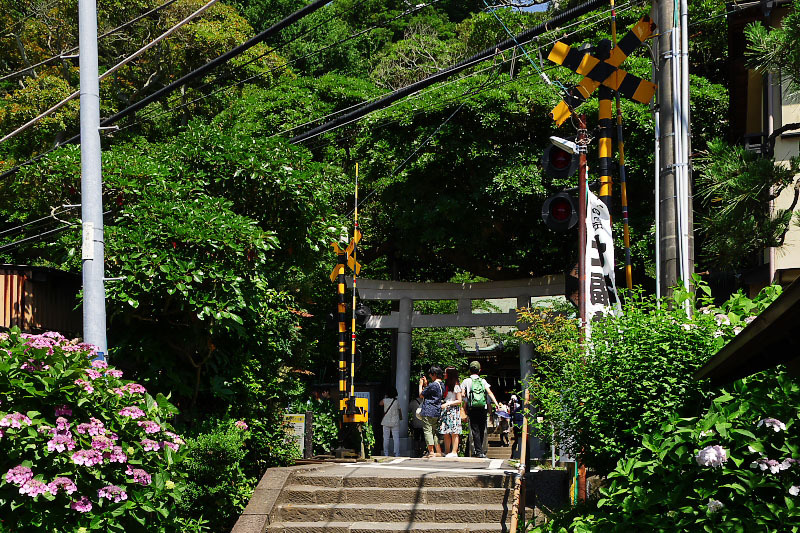 This Amanawa Shinmei Jinja Shrine [甘縄神明神社] is said to be the oldest shrine in Kamakura. 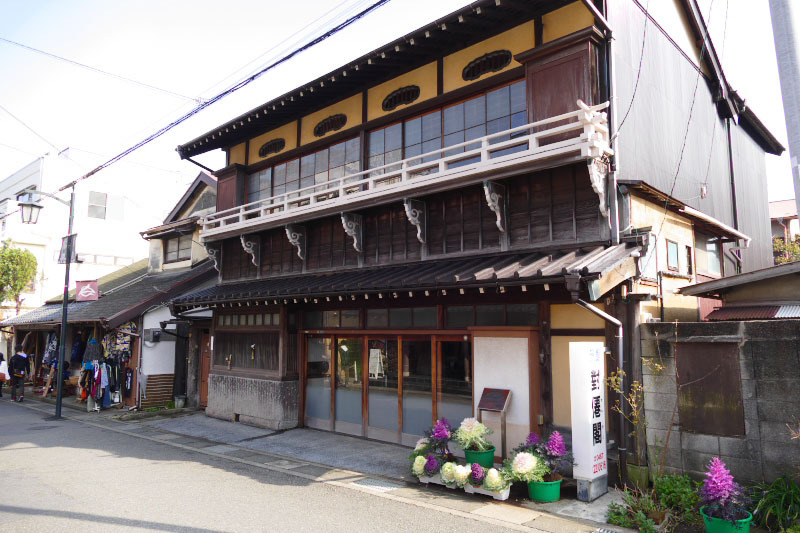 It was founded in 710 and deeply connected with Genji family. 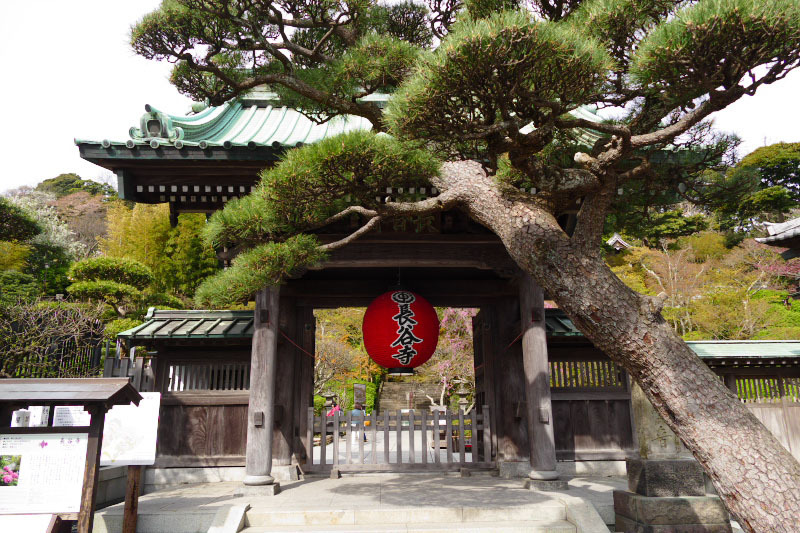 Especially, Minamoto no Yoshiie (the 2nd shogun of Kamakura Shogunate) is said to have been born with the benefit that his father prayed that he would like to give the child to the shrine. 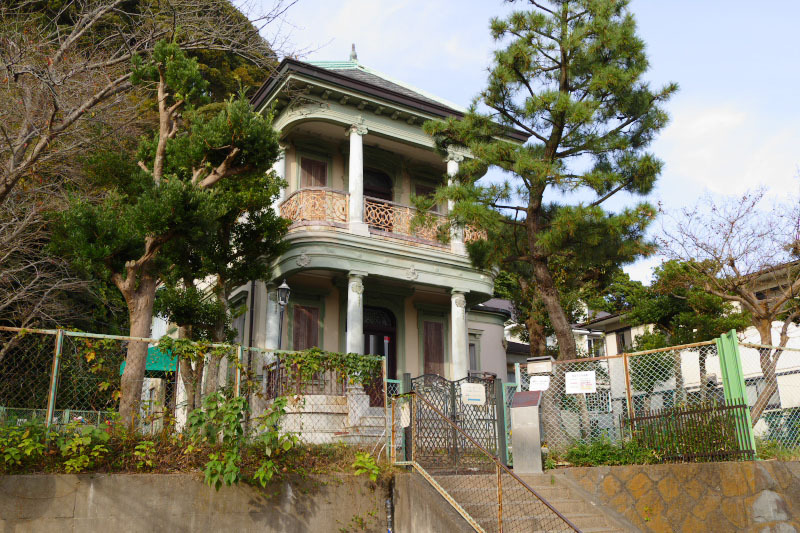 There is also a house near the shrine where Yasunari Kawabata [川端康成], a novelist who won the Nobel Prize for Literature, lived. 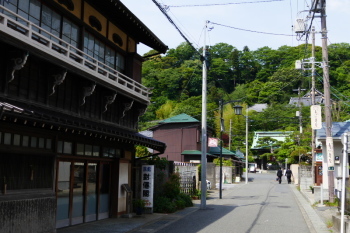 Walking through Hase town towards the sea, you will be on the wide and long sand beach. 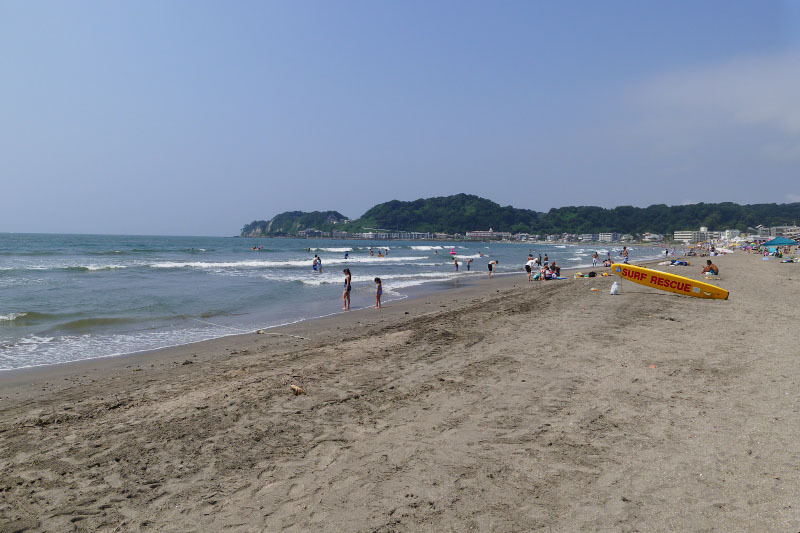 Here is Yuigahama Beach [由比ヶ浜海岸] along with adjacent to the east Zaimokuza Beach [材木座海岸] is the main beach of Kamakura. As it becomes a swimming beach during the summer, it is crowded with many visitors.